Scientists are trying to find out which genes govern whether or not people live long lives. A study will take DNA samples from 3,000 90-year-old brothers and sisters. A team led by Professor Claudio Franceschi at the Italian National Research Centre on Ageing will then analyse their genetic make-up. Once they have found the genes which govern ageing, they hope to develop medicines which allow people to stay healthy for longer. Professor Franceschi said: "Theoretically, there is no upper limit for human life, so 110, 120, 125 and so on is possible." The Genetics of Healthy Ageing study is taking place across Europe at a cost of 7million euros and the plans have been presented to the Human Genome Meeting in Berlin. Professor Franceschi hopes to have identified the relevant genes within five years. 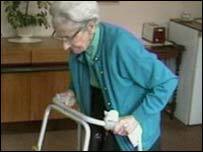 The study will also consider the effect of lifestyle on the age that people live to. "There are certain families that contain several centenarians, which is highly improbable by chance," said Professor Franceschi. The children of longer lived parents tend to survive into old age themselves. Understanding the genetic components of the diseases of ageing such as Alzheimer's Disease should cast light on how the process of deterioration unfolds. Professor Franceschi added: "Not only will it help understanding of ageing itself but it will have a tremendous impact on medicine because the genes that allow you to live longer and in good shape are those that protect from the major killers such as cancer, Alzheimer's and diabetes." The search for the elixir of life has baffled scientists for centuries, and the elderly themselves have their own theories about living a long life. Agnes Henderson, who is 89, said: "The secret of my long life is to keep your mind occupied and not sit and look at four walls and get depressed." Professor Franceschi's team hope to be able to provide a scientific answer to the question, but he agrees that exercising the body and mind are vital. His previous research has studied centenarians and the effect of the immune system on ageing. Andrea Lane at Help the Aged said: "We very much welcome research of this type into the field of ageing. "The development of medication to combat illness in older age is very important. "However, we must concentrate our resources and efforts towards preventing the disabling conditions that destroy quality of life for many older people."